As you might’ve gathered by the timing on these receipts, I usually hit up the Avenues at night, because my days are so full. I have work during the day and social obligations (friends + family) during the evenings. Only at night is my time my own. As such, by the time I’m done, most of the stores are usually closing down for the night or already closed (as evident by the photo). 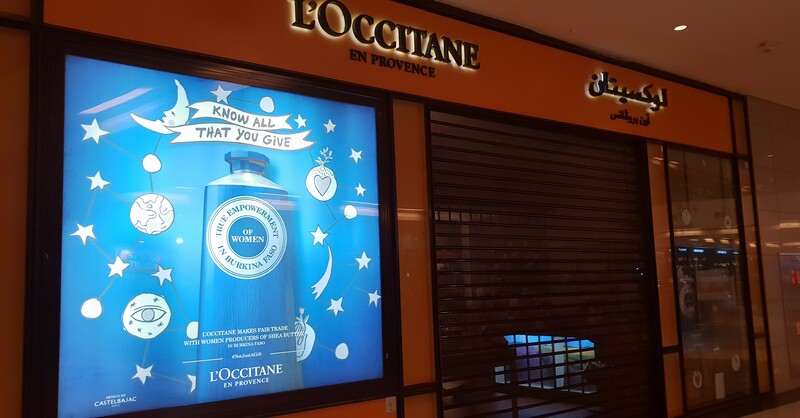 It might sound cliche, but walking around Avenues, after-hours, is quite fun and makes me feel a bit naughty (like I’m seeing something I’m not supposed to or being let in on some sorta’ secret)! Also, it makes taking pics much easier (for example, pics of Dean & Deluca below) because there aren’t any people around. 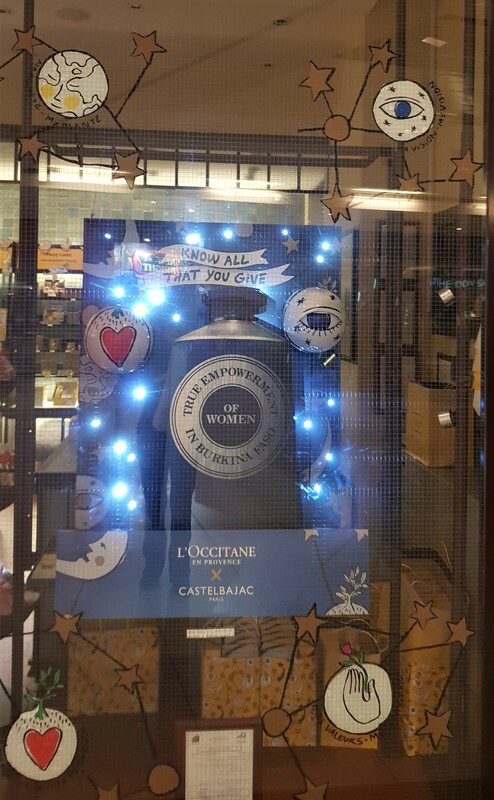 Anyways, L’Occitane was already closed, but I noticed the newer window display – which in keeping up with one of the current trends – featured a celestial theme complete with stars and moons and their version of constellations (each symbol signifies a certain value)! Earth: My Planet (Give a commitment to nature) – protecting and promoting unique biodiversities and have contributed to protecting 150 varieties (Immortelle and Almond Trees and Lavender and more) since 2008. Eye: My Vision (Give millions pairs of eyes) – partnership with UNICEF resulting in 5 million people receiving eye care (fighting preventable blindness) since 2000. Flower/Hand: My Commitment (Give women empowerment) – partnering and empowering women in Burkina Faso creating a sustainable supply chain of shea butter cooperatives since 1980. Never heard of CastelBajac (Casterly Rock?) before, but based on what I’ve seen so far, seems quite similar to drawings “designed” by my 8-year-old niece. In all seriousness though, the story behind each gift and its value is quite lovely and charming! You can learn more from the official website (here). This has nothing to do with anything, but since there were no people around I decided to take advantage of the situation and take a few photos. On my trek back to my car (gotta’ take the escalator shown in the bottom left corner photo) I noticed that Dean & Deluca had already put up their Christmas display! I thought it was quite pretty! I just love fairy light!